Traditional almond dragees made with all-natural colors! 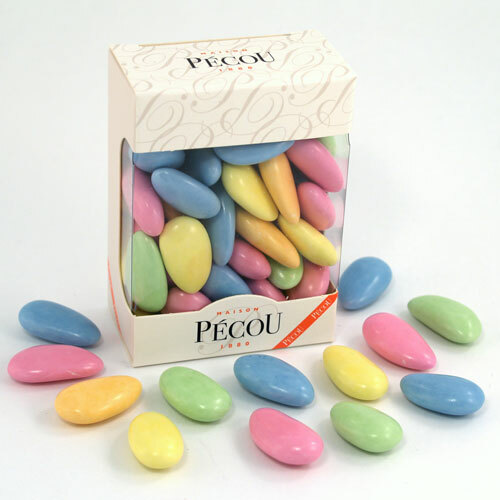 They're called Jordan almonds in the US, but wait until you try these beauties from France. The candy shell is quite thin making them gentler on your teeth and allowing the almond flavor to shine. The elegant box shows off the pretty all-natural colors - a mix of shiny pastels: blue, pink, green, orange, and yellow. Perfect for occasions like weddings and showers or as a healthy everyday candy snack. 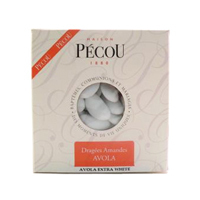 Ingredients: Almond (50%), sugar, thickener: arabic gum, natural vanilla flavor with other natural flavors, colors: titanium dioxide, red beet juice concentrate, enthocyanins, turmeric oleoresin, paprika, glazing agents: carnauba wax, bee wax. Vegetarian info: Contains bees wax. 4.55oz (130g) or approximately 50 almonds per box. Box size is 2.5" x 3.5" x 1.25". These Jordan Almonds are so yummy!! I loved them! The outer shell is the perfect crunch! The Almond is fresh! These are so good! I have never liked Jordan almonds, but my son has always wanted to try them. Finding these with all natural colors and flavors was very lucky, so I got one box for his Christmas stocking. 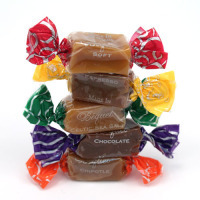 On Christmas morning, we all tried one of them and OMG they are delicious! I just can't believe how good these are, and my husband said "I could eat these by the pound". These are so incredible!